The dish, with flat everted rim, is decorated in the center with the large coat-of-arms of Johannes Camphuijs of Haarlem, enclosed at the rim with small vignettes of ladies at various leisurely pursuits. The reverse is painted with ten small floral sprays and a central peony medallion in a pencilled style on the base. 10 1/8 in. (25.7 cm.) diam. Provenance: Ralph M. Chait Galleries, New York, 1987. 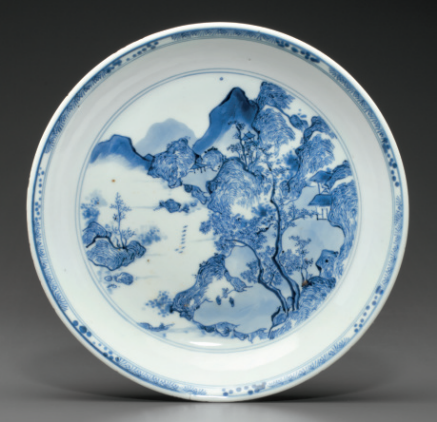 Notes: This dish is a beautiful example of the earliest of private orders with Dutch arms, exhibiting a combination of Chinese and European painting styles. 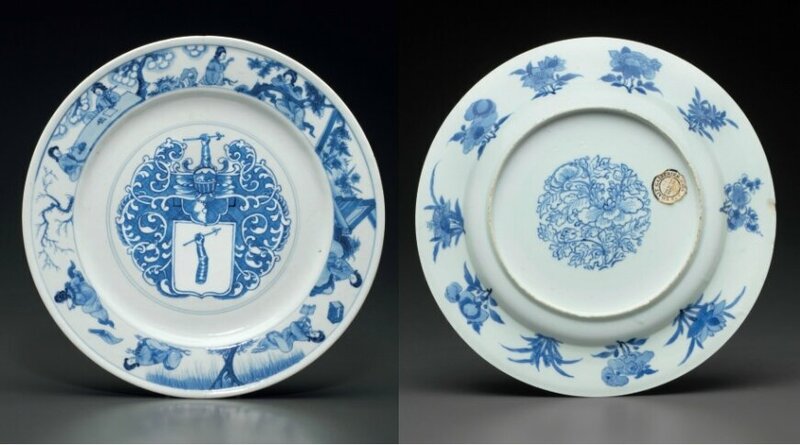 The cross-hatching evident in the ground of the central arms indicates it was copied from a European printed source, while the different ladies on the rim are typical of decoration on wares for the domestic market in the Kangxi period. The decoration on the back is quite unusual, combining more standard flower sprays around the rim with a central medallion painted in a penciled style seen on earlier Transitional wares. A similar example in the Gemeentemuseuem Den Haag is illustrated by Jan Van Campen and Titus Eliëns (eds. 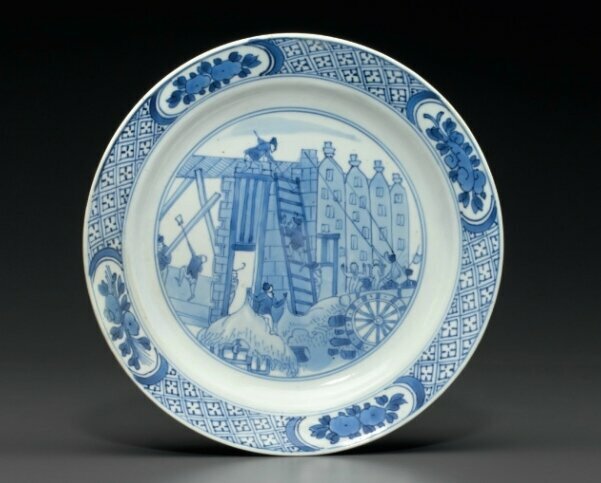 ),Chinese and Japanese Porcelain for the Dutch Golden Age, Amsterdam, 2014, p. 210, fig. 16. Another, in the Groninger Museum, Groningen, is illustrated by Christiaan J.A. Jörg in 'Chinese Porcelain for the Dutch in the Seventeenth Century: Trading Networks and Private Enterprise', The Porcelains of Jingdezhen, Colloquies on Art & Archaeology in Asia No. 16, London, 1992, p. 198, pl. 10.